P0954. 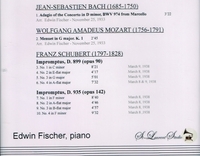 EDWIN FISCHER: Bach, Mozart & Schubert (the latter’s Impromptus, D.899 & 935). (Canada) St Laurent Studio YSL 78-014, recorded 1933 & 1938. Transfers by Yves St Laurent.